The HP MSA 1050 SAN brings the most affordable flash storage and management features to small to medium size businesses! Created to deliver advanced features in an entry level storage device, the MSA 1050 storage array is one of the most versatile storage arrays industry wide. With easy expansion of up to 3 additional drive enclosures, a business can easily increase their array storage capacity as needed over time. Advanced software features such as thin provisioning, snapshots (up to 512), volume copy, space reclamation and more are built into every device. Plus with a dual controller that supports Fibre Channel, SAS, and iSCSI protocols connecting to other devices is a breeze! 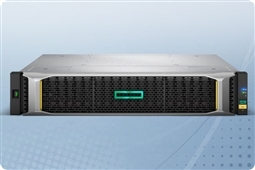 All Aventis Systems custom HPE MSA 1050 SAN storage arrays come with a standard 3 years warranty with upgrades to NBD parts and Extended warranty terms available. Have storage questions? Please use our Live Chat for a quick response, call us at 1.855.AVENTIS (283.6847) or email us at Sales@AventisSystems.com. Browse the products below today and bring the best SAN storage and all flash storage features for the best prices to your business today with the HP StorageWorks MSA 1050 SAN from Aventis Systems! HP MSA 1050 SAN LFF Storage, 12 x SAS or SAS SSD 3.5"
HP MSA 1050 SAN LFF Storage, 6 x SAS or SAS SSD 3.5"
HP MSA 1050 SAN SFF Storage, 24 x SAS or SAS SSD 2.5"
HP MSA 1050 SAN SFF Storage, 12 x SAS or SAS SSD 2.5"